An afternoon at Twelfth Night | Damian Trasler's Secret Blog - Do Not Read! 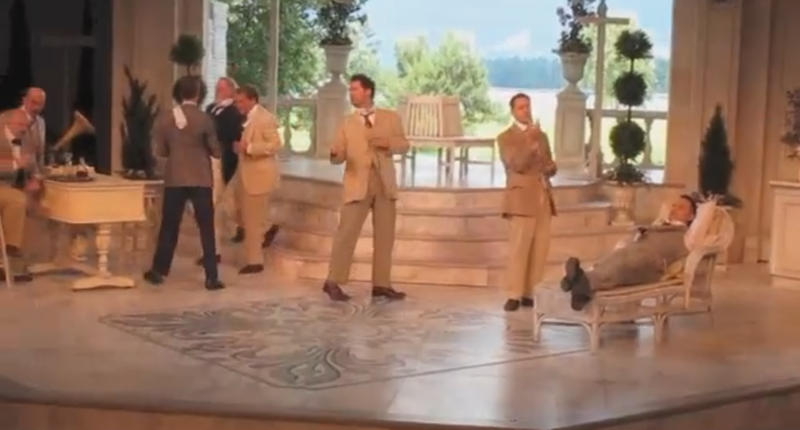 Screen-grab from YouTube : Go see it in 3D in Vanier Park! I am often surprised by the things my Weasels enjoy, or think about. Last year, I had trawled through the selection of things to watch while I ironed, and found a brilliant film version of “Twelfth Night” (By Shakespeare, in case you were wondering.) Tiny Weasel, and then Middle Weasel crept in, drawn by the sounds of TV, and both watched the film with apparent interest. 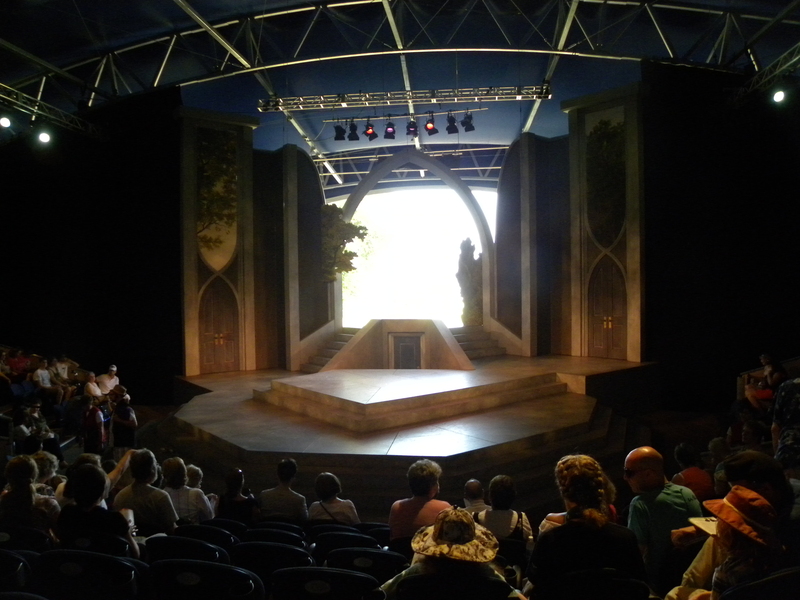 So when it turned out that “Twelfth Night” was one of the plays in this year’s Bard on the Beach, we booked tickets. We would have booked tickets anyway, but there was, at least, a reason for choosing this play over “Hamlet”. Just like last year, I was tremendously impressed. Firstly, the staging is so simple. With an entrance from the back of the stage and two side entrances, and all props and set wheeled or carried on by the actors themselves, we moved from Hotel, to beach, to Bath house and on. It sounds simple enough, but I read plays every week that struggle to convincingly produce two or three locations on one stage. Like many playwrights, I prefer to find a single location for my action to simplify staging*. Seeing productions like this makes me feel I am limiting my imagination too much. It’s also the definition of what makes theatre a different experience from film. This production moves the time period to the 20’s with jazz as a soundtrack and Olivia’s House is presented as a hotel. However these details don’t really matter, as the quality of the acting and the singing soon sweep you away into the story. Like many of Shakespeare’s tales, it’s a little unlikely – twins separated by a storm, the girl dressing as a boy to preserve her safety and falling into the service of local Duke. She is forced to carry his profession of love to Olivia, even as she herself has fallen in love with him. Olivia is too deep in mourning the death of her brother to hear talk of love, until she sees the disguised Viola and falls in love with him/her. It’s the classic love triangle. As a subplot you have the officious Malvolio (here the Hotel Manager) tricked into believing that Olivia is in love with him and desires that he dress in ridiculous stockings and smile more. To add to the confusion, Viola’s brother appears, now her true double since she’s disguised as a boy and willingly consents to marry Olivia, who thinks he’s Viola, whom she calls Cesario… You get the picture. Tiny Weasel found it hard to stay still, but she wasn’t bored. She watched the whole production and followed the story without a problem. It wasn’t updated language, but the original text, and all three Weasels enjoyed it immensely. I’m really glad we went, and we’ll go back again next year. *It’s true that a director can make the decision to radically alter the staging, but in Shakespeare’s theatre, all these locations would have been presented in the one area, and the impression of each given more through dialogue and mime than exotic set dressing. The Bard on the Beach production is, therefore, very traditional in nature. I believe the onus is on the playwright to communicate the nature of the intended staging. Whether or not the director takes that intention to heart is out of the writer’s control. This entry was posted in Emigrating with Weasels, Writing and tagged Bard on the beach, Shakespeare, Summer, Twelfth Night, Vancouver, Vanier Park. Bookmark the permalink.